Roadsign "Beech Barns" is visible. 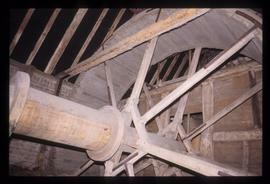 17th Century donkey wheel, Wardown Park, Luton. Donkey in wheel drawing water at Birling Farm. The Great Well, Carisbrooke Castle, Isle Of Wight. Donkey working Mexican flour mill, Mexico. 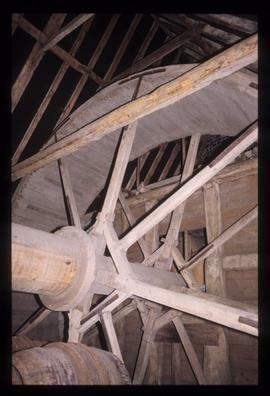 "Donkey pump ("Persian Wheel") Boland Museum Worcerster, Cape Prov 11/85". Piece in 'The Times' about the efforts of Hugo and Kenneth Major to save at least some of the 27 surviving "donkey wheels" that used to draw water up from wells etc. Donkey crushing rice in China. Sited to haul water from 60 foot deep well.